This site is maintained by EdTech Strategies, LLC as a free service to the K-12 community. If you value or benefit from this work, please consider making a donation and/or becoming a supporter today. Keeping the K-12 Cyber Incident Map and related resources up-to-date takes a substantial amount of time, as does the production of original research and commentary on school cybersecurity-related issues. All of this costs money (as do the hard costs associated with hosting and maintaining a website, cyber incident database, and email newsletter). The main reason to support this work, thus, is to keep it independent and online. In addition, your support is integral to future enhancements to this site, including to the launching of a community of practice focused exclusively on issues of K-12 cybersecurity and to continuing important outreach and education efforts. Sign up for Keeping #K12Cybersecure, the newsletter of the K-12 Cybersecurity Resource Center, and recommend it to colleagues. Follow @K12CyberMap on Twitter. Write articles or blog posts that link to the K-12 Cyber Incident Map or resources published on this site. Contact me with tips, suggestions, or if you are interested in the rights to re-publish copyrighted content on your site. In lieu of a 3rd-party Patreon (or similar) page, you can make a small one-time, monthly, or annual pledge to help underwrite the costs of operating the site directly. Bitcoin accepted. Cancel anytime. 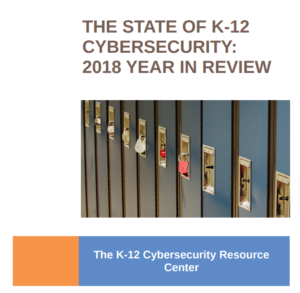 Subject to approval, the K-12 Cybersecurity Resource Center will accept up to two (2) sponsored blog posts per month directly relevant to the interests of K-12 policymakers, administrators, and technology professionals. No link swapping; no tracking scripts; no endorsements; acceptance of terms required. Contact me to learn more and schedule your post. Subject to approval, the K-12 Cybersecurity Resource Center will accept a single site and newsletter sponsor on a monthly basis. Highlight your brand, while delivering a brief message to our growing audience. No link swapping; no tracking scripts; no endorsements; acceptance of terms required. Contact me to learn more and schedule your sponsorship. Receive research-based and entertaining insights into K-12 cybersecurity threats, trends, and risk mitigation strategies tailored to your audience: policymakers; administrators, teachers, and staff; sales and marketing teams; security professionals, etc. (A sampling of past and future speaking engagements can be found here.) Contact me with your requirements and event dates. The K-12 Cyber Incident Map is powered by a unique database of information about school cybersecurity incidents and the districts they’ve affected. Address strategic questions facing your state, district, or organization. Reach your audiences with timely, research-based insights. Advocate for your policies and ideas. Contact me to discuss your requirements. Other ideas? Want to be kept informed of other opportunities to collaborate? Contact me.